Discover Bali’s natural wonders, historic temples, and UNESCO-listed attractions on this private full-day tour. Traveling by private vehicle means that you can spend longer at the sights that interest you most and stop as often as you like to take photos. 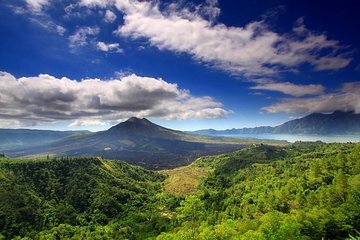 Visit Tegenungan Waterfall, Goa gajah temple, and Ubud Market; admire the Tegalalang rice terraces; and enjoy lunch with a view of Mt Batur and Lake Batur.